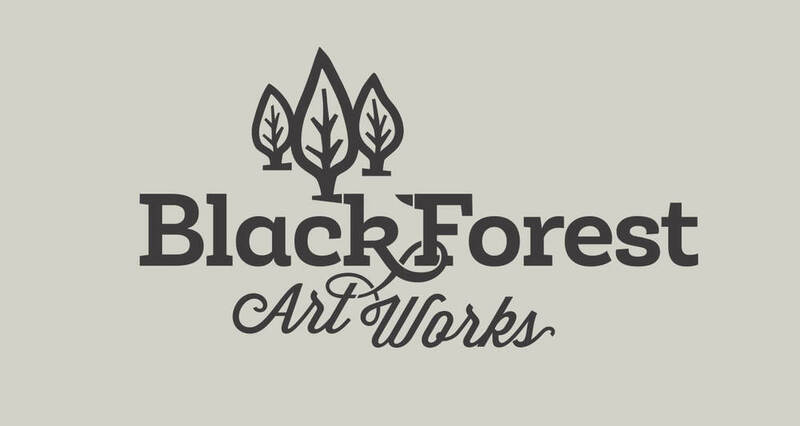 Black Forest Artworks is primarily a blacksmithing business, based in Washington DC. They produce hand-forged custom items, as well as offering historical blacksmithing demonstrations. A husband and wife team, the business also encompasses other creative practices and products such as photography and artisan soap-making. The clients, Jeff and Caitlin, approached me having been referred by a previous client. To design a logo which would reflect the main blacksmith nature of the business, but also work for their other products. I wanted to create a strong logotype, but with a hand-crafted, bespoke fee. The blocky nature of the fonts chosen and the trees icon all specifically relate to the sorts of shapes Jeff forges out of iron. To complement the main logo, I also produced a brand stamp - a more compact version to be used on packaging, labels etc. “Overall, you did a great job! We are very happy with the results of the now two projects and we cannot think of any ways to improve what you did for us."